The Israeli army served Bil’in villagers a seizure order for six dunams yesterday. The villagers responded by expanding their own outpost, building a second house on the west side of the annexation barrier. The military order was issued for the construction of a watchtower adjacent to the route of the barrier that will separate villagers from approximately half their land. At 8 p.m. a group of villagers constructed the new house in less than two hours. 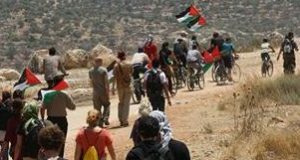 Israeli soldiers arrived on the scene and attempted to stop the construction but, dozens of villagers barricaded themselves in the structure. Wednesday morning, contractors working on building the Metityahu Mizrah settlement dumped rubble on Palestinian villagers who stood in front of their bulldozers. 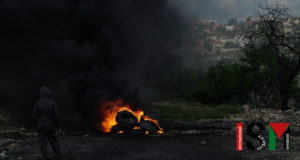 Popular committee member Muhammed Khatib was lightly wounded while he and other villagers attempted to prevent contractors from blocking the road to the new structure. Construction on Metityahu Mizrah has been frozen by a Supreme court order but the contractors continue to prepare the foundations for the settlement outpost, an act which they claim does not constitute construction. Bil’in villagers await a ruling from the Israeli Supreme Court regarding the route of the annexation barrier on their land. The construction of “Bil’in West,” the first Palestinian settlement, marks a new and creative advance in Palestinian nonviolent resistance. The two structures place Israeli authorities in an embarrassing position. Israel will highlight its own selective law enforcement policies if the houses are demolished and recent additions to Metityahu Mizrah, which lack building permits and are illegal even according to Israeli standards, are not. “As owners of this land, we have the right to decide its future,” Khatib said.